Between 1943 and 1945, at their meetings in Tehran (1943), Yalta (1945), and Potsdam (1945), the three major allies: the UK, the USA, and the USSR agreed on the necessity for punishing the major war criminals of the European Axis countries. France was also given a place on the Bench. The legal basis for the trial was established by the London Charter in August 1945, and based the jurisdiction of the International Military Tribunal (IMT) on the Instrument of Surrender of Germany, and sovereign authority over Germany having been transferred to the Allied Control Council, which had the power to prosecute violations of international law, and the laws of war. 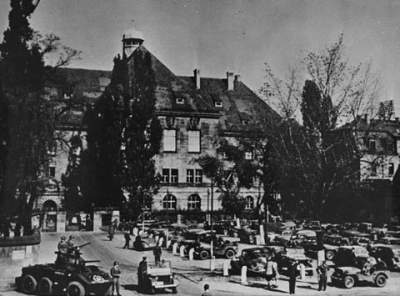 Nuremberg was the location chosen for the trials, partly because it occupied a prominent place in the history of the Nazi party, and partly because it was one of the few suitable buildings in Germany, including its prison, largely intact after the war. The proceedings of the IMT commenced in Nuremberg on October 18, 1945. Indictments were presented against 24 major war criminals, and six ‘criminal organizations’: the Nazi party, the Schutzstaffel (SS), the Sicherheitsdienst (SD), the Gestapo, the Sturmabteilung (SA), and the General Staff, and High Command.